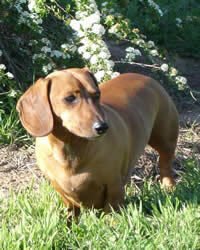 The Dachshund breed is a hunting dog that loves to dig and track scent. It does well in an apartment, but since it is a hunting dog it also loves its walk in the wild. This small dog breed is very energetic and they have a pleasant look on their face (if you have one, you know what I mean!). They come in three coat varieties – Smooth, Longhair, and Wire. Because of their shape, they are also commonly known as a wiener dog or saugsage dog. The Dachshund originated in Germany and was bred to hunt badgers. Their name actually means badger (dachs) dog (hund) in German, although later breeding extended their hunting prowess to rabbits and fox. Their breeding has elements of German, English and French hounds and terriers. The AKC registered this breed in 1885. The Dachshund is a very loyal and playful dog, making them a good family dog. They are sociable and love being with their family. They also love to dig and can be very mischievous, so you need to keep an eye on your new “best friend,” especially if you have a garden. Although this breed is okay with dogs of their own size and with kids, it is important that kids do not treat a them roughly as they are sensitive and do not like this kind of handling. In fact, too much rough play can actually lead to back injuries. Living Environment – The Dachshund breed does well with families that give them enough attention. They are well suited for city life and are among the best apartment dogs, provided they receive enough exercise and attention. Although they are happiest when allowed to sleep indoors, they also do well living outdoors in warm weather. Grooming – The smooth coat variety requires minimal grooming. If you own a long-haired variety they should receive twice-weekly grooming, and wire coat varieties require grooming once a week. Diet & Exercise – Dachshunds do not require a lot of exercise, so a short daily walk is adequate. Because they tire easily, more frequent short walks are better than one long walk. During play time, make sure they do not jump or run too fast as this can lead to back injuries. Health – The average lifespan of a “wiener dog” is 12-15 years. They have a tendency to put on weight, so close monitoring of their diet is important. Back problems are common due to their long spinal column and short rib cage, and an overweight dog will be even more prone to back issues. Other common health concerns include canine diabetes, luxating patella, elbow dysplasia and progressive retinal atrophy (PRA). This “determined” breed requires firm and consistent handling during dog training, as it can be quite stubborn. However, a gentle manner and positive dog training (praise and rewards) are important as the breed is quite sensitive. They do well when trained with a variety of training methods.